CONTINENTAL Professional - you're choosing quality. Every product in the CONTINENTAL Professional range has been specifically designed for the needs of foodservice professionals. The range provides quality products whilst ensuring maximum yields and no wastage. 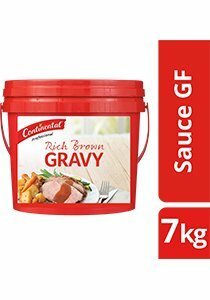 Use CONTINENTAL Professional Instant Gravy as a base or as a finished sauce for meat and vegetable dishes. Can be prepared on a stove top, for a thicker consistency. Fill a jug with boiling water. Gradually add CONTINENTAL Professional Instant Gravy to water and whisk vigorously for 1 - 2 minutes until smooth.